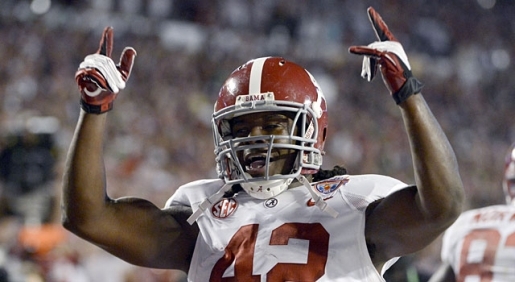 Eddie Lacy celebrates another Alabama championship. The more things change, the more they stay the same. In 2010, Alabama won a national championship. In 2012, Alabama won a second national championship. In 2013, Alabama caps yet another season by winning a national championship. Despite being ranked behind the Notre Dame Fighting Irish, the Crimson Tide and coach Nick Saban have proven beyond a shadow of a doubt that no football conference (or lack thereof in Notre Dame’s case) prepares you for physical, punishing football like the Southeastern Conference. Alabama destroyed Notre Dame 42-14 at Sun Life Staduim to win the NCAA National Championship. “I am satistifed with this team. They were never entitled. I’m proud of what they accomplished. Now we’ve got to go to work on next year,” said Crimson Tide coach Nick Saban. With the amount of returning talent on that team is combined with the incredible recruiting classes raked in year in and year out by Nick Saban and company, I have absolutely no doubt that Alabama is the early favorite to win the national championship in 2013 and for pretty much as long as Nick Saban continues to prowl the sidelines in Tuscaloosa. Back-to-back-to-back titles? Besting Bear Bryant’s six national championships? It’s all within reach.